One of the best things we can say about our experience with JacksonBuilt Custom Homes is that they truly cared about our project. Richard was fully engaged and helpful during the architectural design phase of our home and was able to execute our vision. Allison was invaluable helping with the interior design and selections. She is extremely talented, very patient and did her best to keep us on budget. The entire staff is very professional and helpful. We absolutely love our new home and couldn’t be more pleased with the final product. Not only would we recommend JacksonBuilt to anyone, but we would also hire them again if we ever built another home. They simply do NOT mass produce homes. Richard Jackson (owner) is intimately involved with every aspect of the project. All of the decisions, changes and updates are made quickly and precisely. Our biggest surprise and what completely exceeded our expectations was the Jackson team of people that worked with us. They are incredible at what they do in their respective responsibilities and simplify the entire process for you. When we started our project, we finally decided to go with JacksonBuilt Custom Homes to build our new home on Daniel Island and now that the project is over, we consider them our friends! When we first thought about building a home we were quite wary. We had no experience with it and had heard lots of horror stories over the years. But after talking to Richard and Kimberly we were immediately put at ease. The Jacksons business philosophy is very simple: it is called The Golden Rule. Countless times over the course of construction small things that we hadn’t even noticed were improved upon, re-done or replaced because Richard or Kimberly were not quite pleased with the result. Every element of construction was effectively negotiated. Even the parts of the process that are necessarily arduous, like picking materials, the Jacksons made pleasant and efficient. The result is a home that we couldn’t be happier with, and now that we have been in it for over two years, we can attest to the quality of the construction and the integrity of the Jacksons. 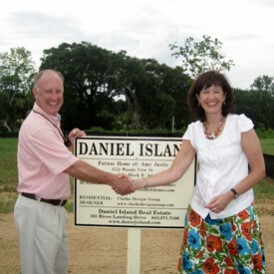 We were living in New Jersey and wanted to move to Daniel Island. While looking for land we met Richard Jackson of JacksonBuilt Custom Homes. 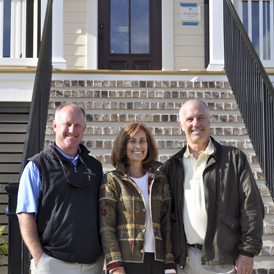 He showed us a home he had completed on Daniel Island, and several others in various stages of construction. We were impressed with the detail and quality. His crown moldings, window, door and baseboard trims were very much the style of home we wanted to build. Our only concern was that we were living 800 miles away in New Jersey and would not be able to oversee the construction. He assured us he would keep us “In the loop” during all phases of construction. 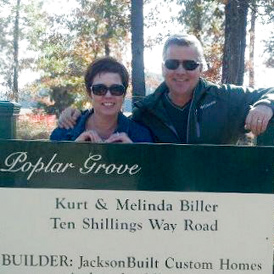 After choosing the homesite and selecting JacksonBuilt, we provided a long list of “must haves” for our new home. Shortly thereafter, his architect provided preliminary plans which were close to what we wanted. All during the construction process he was easy to work with and attentive to our requests and questions. We made a trip to Daniel Island about every other month to review the construction and select all the many details necessary to make the house “our home”. His design coordinator, Allison Casper, was a delight to work with, had many helpful suggestions, and always followed through on execution. This was the fourth home we had built and it went the smoothest, although we were the furthest away! We would highly recommend JacksonBuilt Homes to anyone who wants a well constructed home built by a detail oriented and responsive team. It was a pleasure to work with them. JacksonBuilt Custom Homes did a wonderful job building our custom home on Daniel Island. The JacksonBuilt team was always available and responsive to questions or concerns, very efficient and worked to keep us within our budget. The project was finished on time. 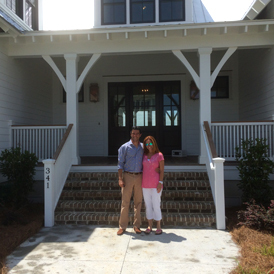 They were a wonderful company and built us a beautiful coastal home! Words seem inadequate to express how happy and thankful we are in our beautiful new home. Your team has been so helpful and easy to work with. Both the building process and the final product far exceeded our expectations. We will be forever grateful to Jay for recommending JacksonBuilt. We are so proud to be part of the JB family and thankful you have become our friends along the way. We had an excellent experience with Jacksonbuilt Custom Homes. We were impressed by their can-do attitude from our first meeting all the way through completion. Richard’s professional knowledge and experience was immediately apparent as he worked with us through the design phase and into the construction phase. This was the fourth home we have built and it was without a doubt the most efficient example of project management we had ever experienced from a builder. The end result was a beautiful home that came in on time and under budget! If you are thinking about building a custom home in the Charleston area I would highly recommend meeting with JacksonBuilt. We hired the amazing team at JacksonBuilt Custom Homes to build our dream home two years ago. It was the best decision we made! The building process went smoothly and was completed on time and on budget. Richard and his team were always available and extremely patient with our lack of knowledge on the building process. JacksonBuilt Custom Homes continues to check in with us to make sure everything is going well in our new home. We have been in our home for a year and continue to sing the praises of JacksonBuilt Custom Homes to our friends and family! JacksonBuilt constructed a fabulous home for me. Attention to detail was excellent in all aspects of the project, including the management of the budget. They provided guidance throughout the process and minimized the stress of building a home. There were very minimal issues but anything that wasn’t of acceptable quality was identified by them and corrected without my needing to get involved. I would highly recommend JacksonBuilt and am thrilled with my home. From start to finish, the process was smooth, exciting and more fun than we could have hoped. Richard’s professionalism and attention to detail are unmatched. He is easy to communicate with, valued our time and, more importantly, he cared about the quality of our house as much as we did. Kimberly has a keen eye for design and was a pleasure to work with as well. She assisted us with interior selections every step of the way, from tile to paint colors to fabrics and furniture. We could not have asked for a better team to make our dream home a reality.